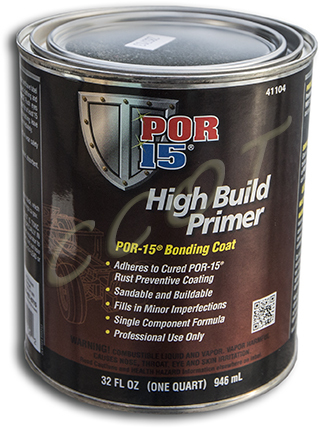 POR-15® is a high-tech, high performance coating that will stop rust permanently. Unlike ordinary "paints", POR-15® is designed to be coated right onto rusty surfaces, leaving a beautiful, rock-hard finish that won't crack, chip or peel. Use it to coat a rusty frame, floor pans, farm equipment, underwater marine items or even a heavily corroded battery tray and stop rust in its tracks! 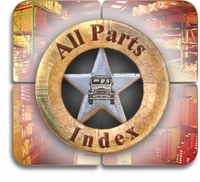 POR-15® products are designed to work as a complete system. 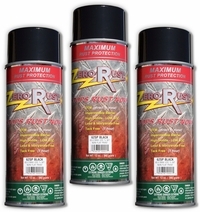 When used together, these products provide you with a coating that will not only stop rust, but will prevent it from returning. POR-15 brings the powerful technology of polymeric isocyanate derivatives to the consumer rust prevention market for the first time, and is vastly superior to all competing products currently on the market. POR-15 is cheaper and easier to apply than epoxies since it doesn't require mixing; and POR-15 dries to a high-gloss finish like paint, except that it cannot be scraped or peeled off. Since POR-15 actually bonds to metal, the underlying surface does not have to be sanded before application. As long as loose and flaking rust are removed from the surface, an application of POR-15 will not only cover up the rust and prevent it from spreading, but will also strengthen the underlying metal and seal holes by forming its own membranes. 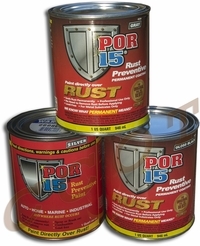 Product Description: POR-15 is a rust-preventive paint designed for application directly on rusted or seasoned metal surfaces. It dries to a rock hard and it prevents rust from reoccurring by protecting metal from further exposure to moisture. POR-15 is sensitive to UV light(sun) and must be top coated before prolonged exposure to sunlight. POR-15 is cured and strengthened by exposure to moisture and will dry faster under extreme humidity, but moderate to dry atmospheric conditions are most desirable when applying this product. That's because extreme humidity may cause an immediate surface cure, trapping carbon dioxide gas below the surface. When this happens, bubbling may occur. Extreme humidity at the time of application may also interfere with proper adhesion of the POR-15 coating to metal because it's almost impossible to keep metal dry under such conditions. Application Procedures: Surface preparation: Rusted surfaces are best; seasoned metal and sandblasted surfaces are also good. To coat smooth metal surfaces: use POR-15 PREP-READY to prepare surface before painting. The surface must be dry and free of grease, oil, or other foreign substances. 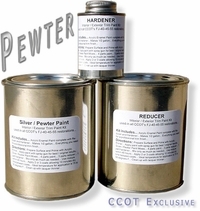 Use of "rust converter" products is not recommended as they may affect bonding of POR-15 to metal. POR-15 likes to adhere to surfaces with "tooth" rather than smooth glossy surfaces. Stir or roll (can) Contents thoroughly before painting. Do not shake (causes bubbling) . Refrigerate unused portion of POR-15 for longer shelf life. Apply in thin coats, l to 2 mil thickness. Minimum 2 coats. Apply second coat when first coat is dry but with slight finger-drag remaining, usually 4-5 hours. 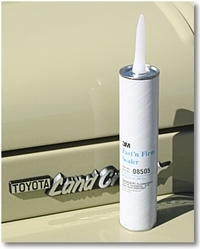 Spray Application: Use 30-35 lbs pressure for normal gloss. Reduce pressure for lower gloss (20-25 lbs). Thin only with POR-15 Solvent, if necessary. To topcoat a fully cured POR-15 surface, scuff with 320 grit (minimum grit) or use brown Scotchbrite pad (Scotchbrite pad is preferred because it dulls finish without removing paint like sandpaper does) until gloss is dull; then paint, or use POR-15 High Build Primer directly on the cured POR-15 surface, then topcoat as desired. NOTE: Never topcoat a POR-15 surface that hasn't cured, as this will ruin the coat already down. 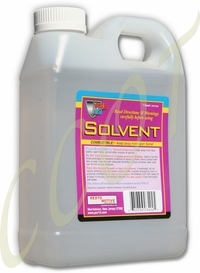 Use POR-15 Solvent or lacquer thinner for cleanup, which must be done before POR-15 dries. NOTE: Organic vapor particulate respirators, NIOSH/MSHA approved, must be used when spraying POR-15. Moisture will shorten the life of unused POR-15. Seal can or jar immediately after using. 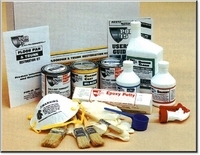 RestoMotive Laboratories restoration products are designed to work as a complete system. When used together, these products provide you with a coating that will not only stop rust, but will prevent it from returning. To aid you in your particular rusty metal project, we have included the following steps to explain the various stages in rust prevention. All RestoMotive Laboratories products are available individually and many are available in efficient, cost saving kits geared to your specific restoration need. Here is how the system works. STEP 1... Degrease and Clean Surface …Clean the rusty metal surface with MARINE-CLEAN NOW CALLED CLEANER DEGREASER - Industrial Strenght Cleaner / Degreaser. An environmentally safe cleaner, MARIN CLEAN will remove dirt, grease, wax or other contaminants that could interfere with the restoration. STEP 2... Neutralize Rust; Etch Metal… Prepare the rusty metal surface with PREP-READY NOW CALLED METAL PREP. As a rust remover, PREP-READY will neutralize rust, etch metal for better adhesion, and coat the metal with zinc phosphate to encourage deep chemical bonding of POR-15 to the base metal and rust. STEP 3... 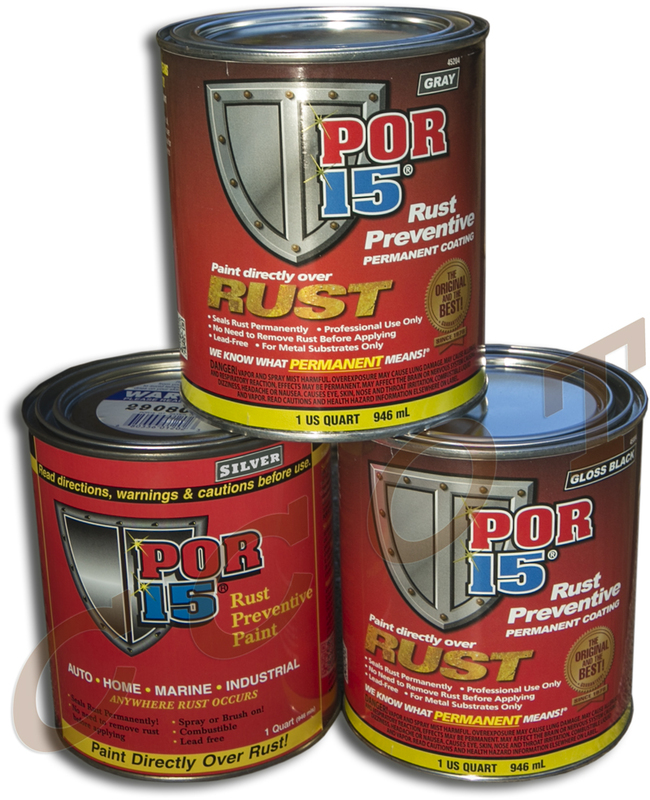 Apply Rust Preventive Coating To Surface… Seal the rusty metal with POR-15 Rust Preventive Coating. As the moisture resistant POR-15 bonds to the rusty metal, it will form an unbelievably tough, almost ceramic-like finish that will not crack, chip or peel. STEP 4, Option "A"... Topcoat The Surface… Topcoat the metal surface with CHASSIS COAT BLACK. The semi-gloss black CHASSIS COAT BLACK provides the frame, chassis and underbody finish desired by most restorers as it protects the underlying POR-15 from harmful UV light. STEP 4, Option "B"... Now, prime and paint right over cured POR-15® with our new High Build Primer.After thousands of requests from customers, POR-15® chemists developed this very special 'interlocking' primer for painting over top of POR-15® with any type or color of paint you choose, without any need to rough up or de-gloss the surface. High Build Primer is a tough-yet-sandable single-component polyurethane primer, with special adhesion characteristics that make it perfect for most painted surfaces... Especially POR-15®. And, it is highly resistant to penetrating topcoats, like lacquers, enamels, and two-component finishes. It sands very smoothly, too. Try some on your next project! Sorry, but CCOT cannot ship POR-15 or Zero-Rust products to Alaska, Canada, Hawaii or Puerto Rico. ORM-D ~ Hazardous materials shipments authorized for non-specification packaging, such as LTD QTY, Consumer Commodities. ORM-D materials cannot be shipped by air ~ ground shipping only. 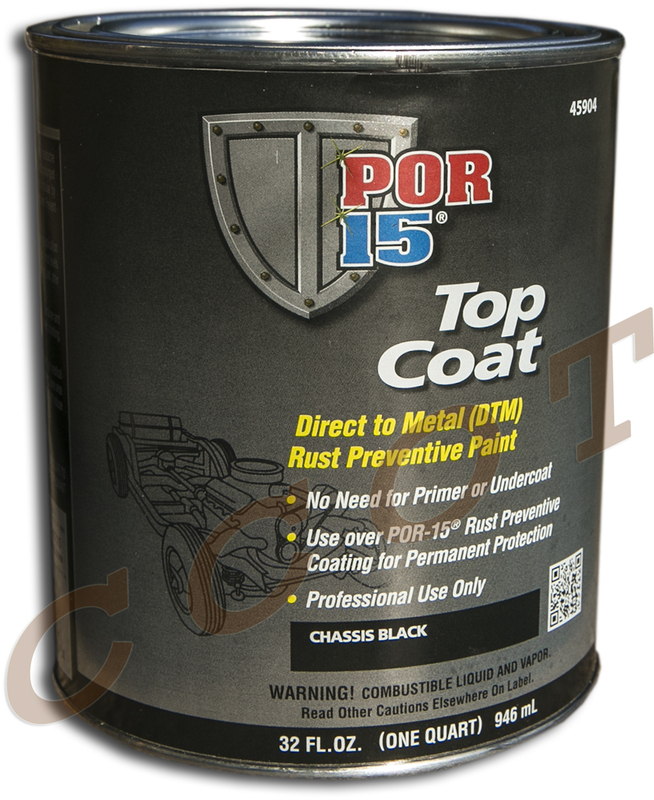 POR-15® Top Coat is a direct-to-metal coating designed to work incredibly well in all applications where there is a need to preserve substrates susceptible to corrosion. Under exposure to sunlight and weather POR-15® Top Coat has exceptional long-term gloss and color retention. POR-15® Top Coat can be applied directly to metal substrates, with no need for a primer or undercoat, and is formulated to form a robust barrier that sheds moisture to provide long lasting protection. 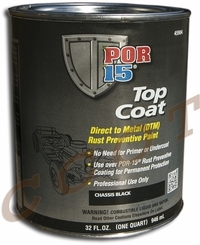 POR-15® Top Coat has excellent adhesion and when used over POR-15® RUST PREVENTIVE COATING the products create a system that works to provide a permanent barrier to corrosion. High Build Primer Now, prime and paint right over cured POR-15 with our new High Build Primer (light gray in color). 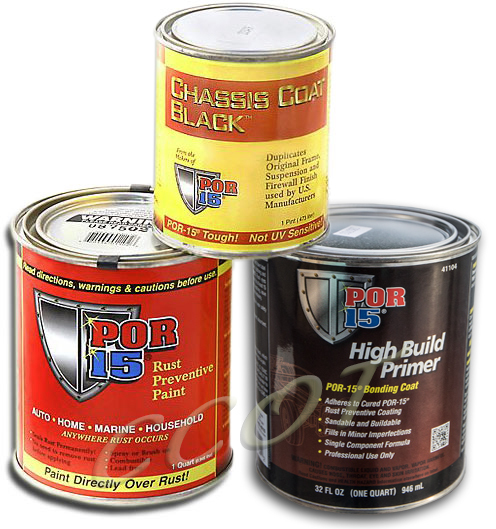 After thousands of requests from customers, POR-15 chemists developed this very special "interlocking" primer for painting over top of POR-15 with any type or color of paint you choose, without any need to rough up or de-gloss the POR-15 surface. High Build Primer is a tough-yet sandable single-component polyurethane primer, with special adhesion characteristics that make it perfect for most painted surfaces...Especially POR-15. And, it is haighly resistant to penetrating topcoats, like lacquers, enamels, and two-component finishes. It sands very smoothly, too. Try some on your next project! Try POR-15 out yourself, at NO RISK. We’re so confident that you’ll be impressed with our products that we put together a wonderful starter kit to let you try some for only $18.91…! You’ll get a screw-top jar of POR-15 (enough to cover 12 square feet), a 1/2 pint of Prep-Ready, 1/2 pint of Marine Clean, two wooden handle paint brushes, and a pair of gloves. Our vinyl gloves are thin, close fitting, and have the dexterity and protection of fine surgical gloves. They are regular cuff length with very high tactile sensitivity and will fit either hand. We've used these vinyl gloves for years and found them to be excellent for even the most sensitive jobs. Keep Hands Clean and Safe! 3M Sealer for Hard Top Raingutter or Body Seam Lines. This is the very seam sealer CCOT uses on all restorations. Off-White in color and paintable. 3M(TM) Fast 'N Firm(TM) Seam Sealer 08505, 1/10 gal cartridge - Firm setting product for sealing interior and exterior joints. Adheres well to clean, bare metal, primed metal and paint surfaces. Skins over quickly. Low shrinkage. Can be painted within 20 minutes. Excellent tooling and sanding properties. Sorry, but CCOT cannot ship 3M(TM) Fast'N Firm(TM) Seam Sealer 08505 to Alaska, Canada, Hawaii or Puerto Rico.